You probably use your Keurig to make coffee more often than you use it to make tea, though there are a lot of K-cup tea options out there to choose from. While I do brew hot water from mine into a mug with loose leaf or bagged tea, I don’t often use prepackaged tea with my Keurig. 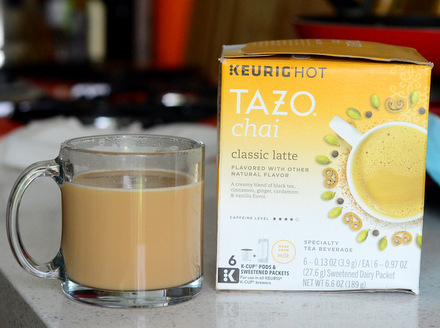 That being said, I immediately liked the idea of this Tazo Chai Classic Latte from Starbucks, which enables you to easily make not just tea, but a ready-to-drink tea latte. The package is really a kit, which includes chai tea-filled K-cups and a powdered mix containing sugar and dry milk. You add the powder to your mug, brew the tea and stir. It couldn’t be any easier – and the drink won’t get cooled down because you’ve poured cold milk into it (which happens to me often). The latte is very tasty, with a nice blend of sweetness and spice and just the right creaminess from the milk. I felt that the team brewed out at just the right concentration to stand up to the milk and sugar. The kit doesn’t foam up, like some other K-cup lattes that I’ve tried, but it still mixes up easily. I will definitely keep this in my cupboard for drizzly mornings when I want a very warming drink to start my day – and I suspect that I’ll come back to it in the afternoons for a pick-me-up, as well.